I am an ecologist and I am an environmentalist, but the concept of sustainability had always bothered me. 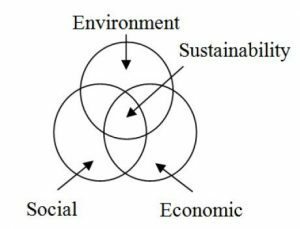 Colleagues had presented sustainability as a Venn diagram with three partially overlapping circles: environment, society, and economy. 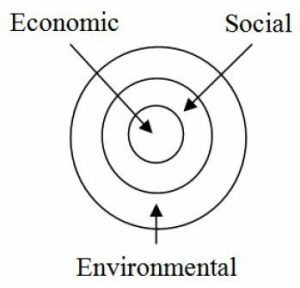 The Venn diagram suggested that parts of the society or economy could be removed from the matrix of the environment. This conceptualization seemed ludicrous: Without the environment, we have no society and we have no economy. Despite my reservations about the concept of sustainability as overlapping circles, I strongly support linking the environment, society, and economy in pedagogy. I wanted to learn how to do so more completely in my graduate-level course, Forest Measurements. The Trillium Workshop, which I attended in January 2016, taught me how. Working with the facilitators of the Trillium workshop, I identified aspects of my forestry course that already exemplified the nested model of sustainability. For example, I devote a large portion of the course to woody plant identification, but when I present these plants, I never focus solely on their ecology or biological characteristics. Instead, I consciously describe the relationship of these plants to society (e.g., medicine) and economy (e.g., economic value and uses). While sustainability was already present in my Forest Measurements course, I have integrated it more fully into the course philosophy, lectures, and assignments. Inspiration from Richard Louv, the noted nature advocate, is part of my course philosophy: “Natural history is as important as human history to our regional and personal identities.” In addition, students are now expected to “identify the environmental, social, and economic effects of forest management practices” to successfully complete the course; this new key learning objective emphasizes sustainability. Four classroom activities are explicitly devoted to sustainable forestry, including a discussion of conceptualization of sustainability, a class period on sustainable forestry and the Duke Forest story, a land tenure field trip, and a guest lecture on Sustainable Forestry certification. With feedback from Sara Childs, director of the Duke Forest and Trillium fellow, I added assignments on land tenure and a reflection on sustainable forestry, using the Duke Forest as a model. Overall, my experience with the Trillium Fellowship provided me with a springboard for making my implicit aim of sustainability education more explicit in the classroom. The workshop also provided me with a new conceptualization of sustainability, resources, activity ideas, and a cohort with which to discuss sustainability and pedagogy. Moir, S. & Carter, K. (2012). Diagrammatic Representations of Sustainability – a Review and Synthesis. In S. D. Smith (Ed. ), Proceedings 28th Annual ARCOM Conference, 3-5 September 2012, Edinburgh, UK. (pp. 1479–89). Edinburgh: ARCOM (Association of Researchers in Construction Management.